Si elle n'est pas toujours subtile, l'intrigue s'avère pleine de surprises et ponctuée de numéros musicaux trépidants. Les personnages truculents, la netteté du récit et les contrastes saisissants qui marquent cet univers à la fois chatoyant et apocalyptique, sauront ravir les jeunes spectateurs. Having donned recyclable 3-D glasses and seen the thing for myself, I'm not sure whether to mock the enemies of The Lorax for their cluelessness, to offer them reassurance or to compliment them for being half-right. Despite the fact that the movie goes about sending the message in the worst way possible, my only hope is that the youngest members of the audience will at least be able to take away a “Trees are good” message and grow up knowing that it is their responsibility to keep the Earth and the environment healthy. As for everyone else, prepare for a movie that is preachy but doesn't really understand what it's preachy about. This is an enjoyable kid's flick with a message for a new generation. The environmental aspect might anger a few people but that same idea is in the book itself, there is nothing new about that here. 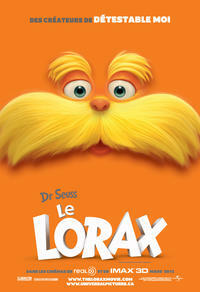 This 3D, animated, idiotically musicalized version of The Lorax thoroughly debases the genius of the good doctor's book, adding characters, twisting plot points, and replacing Seuss subtlety with Hollywood frenzy. The Lorax is perhaps the most blatantly obvious attempt to speak down to people about the perils of industrialization on the environment since An Inconvenient Truth. Somme toute, Le Lorax est un bon petit film trépidant et amusant, qui a de bonnes chances de séduire les enfants comme leurs parents. Green trumps greed in this pleasant, spirited take on the Seussian save-the-planet fable. Mignonne animation qui est un peu gâchée par sa finale qui croule sous les bons sentiments, Dr. Seuss' The Lorax demeure une sortie familiale tout indiquée en cette période de congés scolaires. Sans bouder le plaisir, simple et sain, que procure ce genre de divertissement, on peut quand même être agacé par le ton lénifiant de ces films d'animation « gros budget, grand public », véhicules de beaux messages déjà mille fois assimilés, et qui s'adressent au spectateur, celui de 7 à 77 ans, comme un prof de formation morale parle à sa classe. The most important facets of Dr. Seuss's fable remain intact, from respecting the environment to the importance of taking responsibility - and being honest - in the face of climate calamity. And it remains faithful to the spirit of Seuss. The pro-conservation, anti-consumerist message of the book is heartily intact. And, like the Seuss story, the film never resorts to sermonizing.